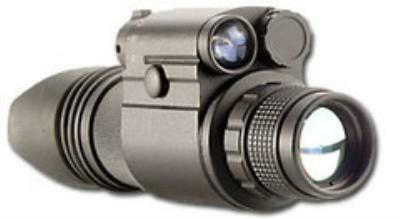 Utilizing a high performance ITT Generation 3, 64-72 lp/mm (typical) image tube, the MV-300 is one of the most powerful and versatile night vision systems in our product line. A long list of standard features are packaged into a compact and rugged housing including; a high-power multi-stage infrared illuminator, Mil. Spec. optics, and an internal low battery/infrared indicator. With an extensive variety of optional accessories including headgear, camera/camcorder adapter, and magnification objectives, the MV-300 can be easily configured for any mission requirement. Export of this product is regulated by the U.S. Department of State in accordance with guidelines of "International Traffic in Arms Regulations (ITAR)" per Title 22, Code of Federal Regulations, Parts 120-130. Pelican Hard Case - Provides protective storage. One (1) 3-Volt Lithium Battery (CR123) - Provides up to 40 hours of operational time. Click the button below to add the Morovision MV-300-A Generation 3 Tactical Monocular to your wish list.